Great 4 bedroom/3 bath lakefront on all sports lake! Great sandy beach and very large yard down to the lake. Cute and Cozy 2 bedroom / 2 bath on Far West Canadian Lake. Central air, internet and cable! 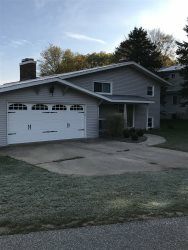 Main Lake 4 bedroom, 3 bath, updated, wonderful lakeside yard, nice beach area, gas grill, fire-pit, dock, outside furniture, dishwasher, microwave, washer/dryer, cable TV with 55 in screen, WiFi internet, central air, no fireplace available.